On the way down, the plane collided with power lines, knocking out power in neighboring homes. The aircraft burst into flames after it crashed, and the wreckage was unrecognizable. Investigators described the plane as a single-engine VariEze, which is a small, homebuilt aircraft. 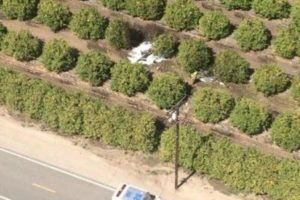 It is believed the plane took off from Santa Paula Airport. The intended destination is not known. Another pilot in the area said he heard the pilot of the homebuilt plane reporting engine failure and saying he planned to make an emergency landing near a riverbed. Investigators have not determined the exact cause of the crash. Authorities have yet to identify the victims. Dang! So close to the road too. Nearly made it. Not sure why, with so many reliable factory aircraft available at decent prices these days, people would trust their lives to something built in a garage. New meaning to the term “lemon laws”. Don’t forget the gravity of the situation.